The newly appointed Hungarian Ambassador to Tanzania Hon. Eduard Laszlo Mathe has assured President Magufuli that his country is ready to cooperate with Tanzania in developing its industrial sector. The announcement was made at the State House in Dar es Salaam on 23rd March 2017, when handing over his credentials. Hon. 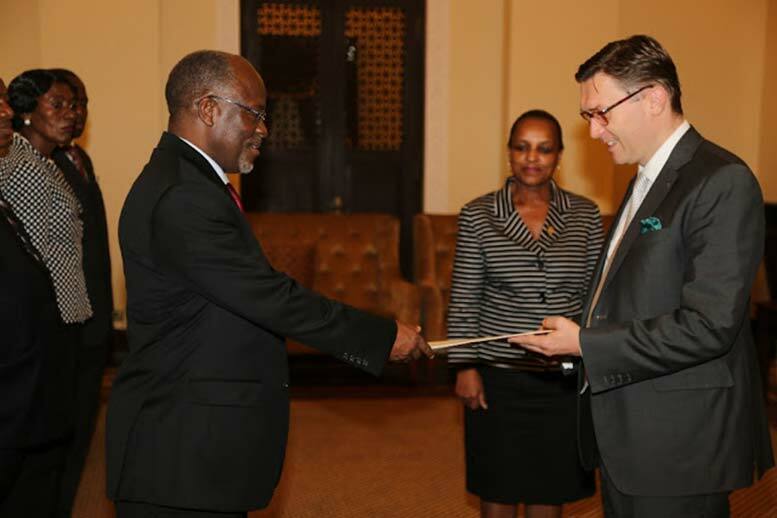 Eduard has congratulated President Magufuli for his efforts in developing the Tanzanian economy and has promised that Hungary will promote and strengthen its cooperation with Tanzania to bring technology in various sectors, including manufacturing and agriculture and will encourage investors to come and invest in the country. During the ceremony, President Magufuli has also received the credentials of the Ambassador of Belarus to Tanzania Hon. Dmitry Kuptel, who indicated that his country has set itself to strengthen its presence in Africa and in Tanzania by increasing investment in industry and commerce. Other ambassadors who presented their credentials are the Ambassador of Guinea Hon. Sidibe Fatoumata Kaba, the Ambassador of Botswana Hon. Lebonaamang Thanda Mokalake, the Ambassador of Niger Hon. Adam Maiga Zakariaoum, and the Ambassador of Mauritius Hon. Jean Pierre Jhumun. “I am told Mauritius makes good textiles and sugar produces, and I will be very happy to see investors from Mauritius to produce sugar in Tanzania,” President Magufuli said. Hon. Magufuli President assured all the newly appointed ambassadors that Tanzania will continue to further strengthen economic relations and cooperation with them.